As previously mentioned, I’ve a small pile of publications bought at the Barbican Bookshop closing down sale. Mainly guidebooks, dating from the 1960s, 70s and 80s. They were basically the last remaining remnants of a once well-stocked ‘York’ shelf of secondhand books. Plus some I found in a box on the floor in the corner. I thought I’d rescue them, and share these glimpses of a York many of us remember. These ads are from a 1973 guide. 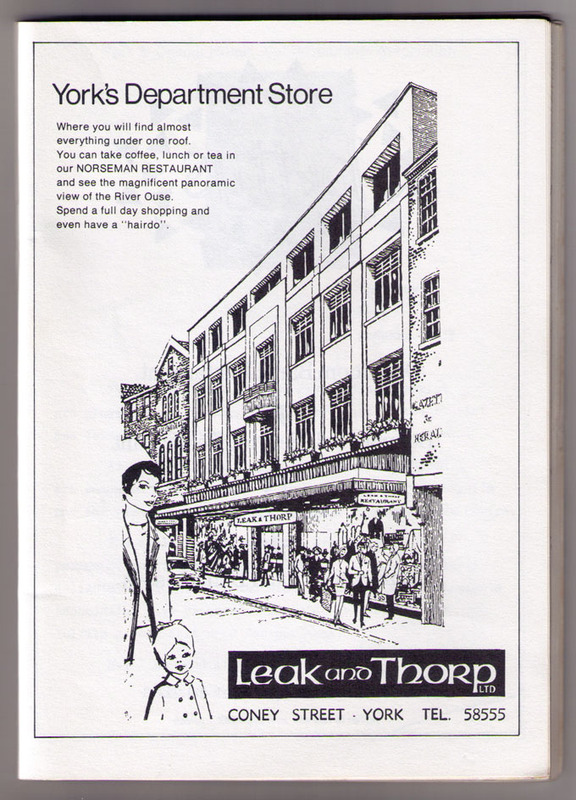 Back then you could get ‘almost everything’ at Leak and Thorp’s, and even get your hair done. ‘Hairdo’ must have been a relatively new and unfamiliar term, the inverted commas around it suggest. 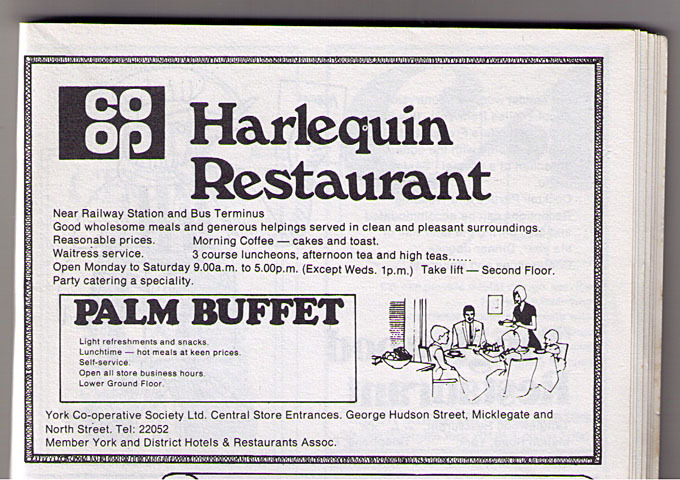 The Co-op, as I recall, was also a massive store, and it too had a restaurant. We must have had far lower expectations back in the 70s – the ‘clean and pleasant surroundings’ are emphasised. 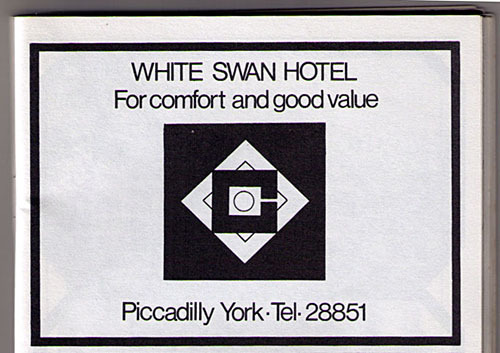 Hey, it’s an ad from the days when the White Swan on Piccadilly was open, way back long ago. The listing in the same publication sheds a little more light on what went on in the White Swan before its decades-long closure. Its ‘Tartina Restaurant’ was an Italian pizza bar and coffee house, offering speciality pizzas. In 1973 you could get your lunch here for 95p, and dinner for £1.15. 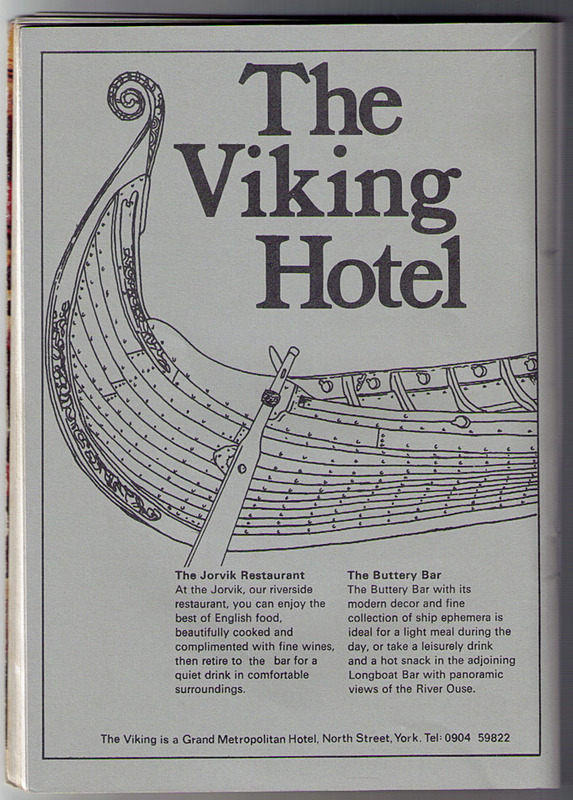 The Viking Hotel, as many of us knew it as for years, though it’s now a Park Inn. That huge building next to the river, on North Street. It was built in 1968, so was quite new when advertised here, in the 1973 guide. It boasted a ‘fine collection of ship ephemera’. After admiring the ship ephemera and the river views you might have fancied a dance. You could pop down to the Old World to get down to the latest tunes, like, er, Get Down, by Gilbert O’Sullivan, and other hits of 1973. Bands like Slade, Wizzard, Deep Purple, The Sweet, songs like ‘Nutbush City Limits’ and ‘Radar Love’. Alongside these memorable musical highlights drifted a river of rather mournful-sounding ballads – Daydreamer/The Puppy Song by David Cassidy doesn’t sound like something you’d be strutting your stuff to on the Old World dance floor. Perhaps something you’d sit in a dark corner and cry to, over a glass of Liebfraumilch. The Old World Club is long gone. 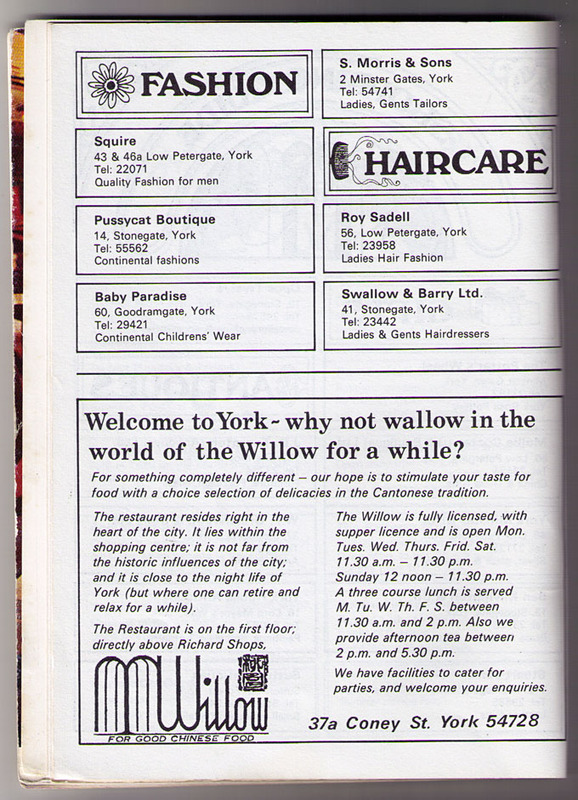 But The Willow is still there, on Coney Street, just like it was in 1973. Back then it was above Richard Shops, which as I recall was a women’s fashion store. ‘Continental fashions’ could be found at the ‘Pussycat Boutique’ on nearby Stonegate. 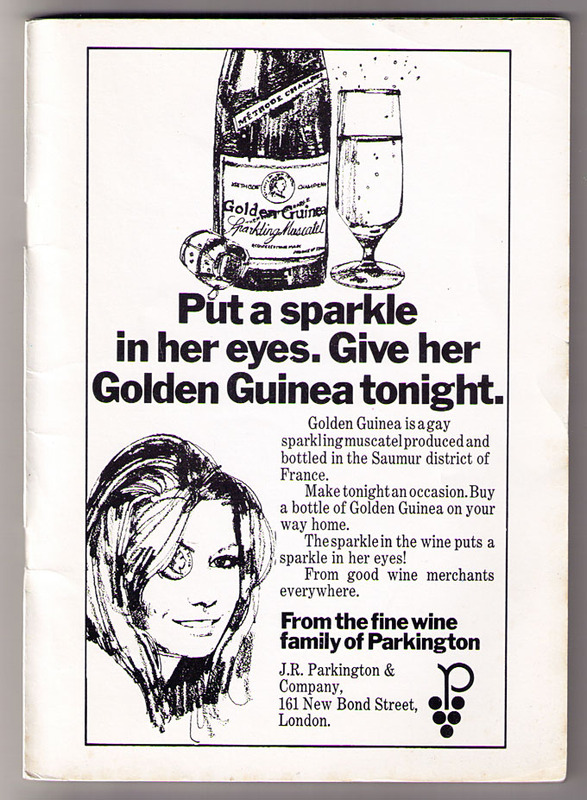 And finally – nothing to do with York particularly, but in the same 1973 guide, and I just had to share it with you, dear readers, as it’s so very 1970s in so many ways. For younger readers I should perhaps mention that ‘gay’, in those days, had a completely different meaning, one now noted by dictionaries as a ‘dated’ usage. The recent debate over the changes in King’s Square included many rather scornful references to the ‘1970s cobbles’, as if the 1970s were so recent that anything dating from that time had no historical significance. When I look at these ads, the 1970s sure looks like ‘history’ to me. In 1973 I was a bit too young to be out dancing at the Old World Club, but if you remember it, or any of the other places, please add your comments and memories below. Source: Ads from the ‘Eating out in York and District’ guide, published by York & District Hotels and Restaurants Association. Foreword by the Earl of Halifax, dated January 1973. Art Direction and Editorial by Capon Associates, York. Printed by Rusholmes, York. Fantastic stuff, thanks for bringing this to light! Despite the name changes these are superb examples of “real history” and of great interest to those who live and work in the city and, dare I say it, every bit as fascinating as our ancient past. I remember seeing dodgy goth bands downstairs at the Old World during the eighties… mainly because I was in one!! Great stuff. Leak and Thorp was too posh for us, but the Co-Op, before it became Victoria House, was enormous. The cafe was incredible, acres (it seemed) of formica and a cabinet of luminous vanilla slices behind little perspex sliding hatches on the sweets counter. It also had those mesmeric orange juice dispensers that constantly swirl and mix watery Kia-Ora. If there was one shop I could bring back though it would be ‘Precious’ on Petergate, I would simply love to take my kids to that shop, a magical toyshop. Remember Old World very well. 72 to 76. First heard Donald Byrds Caricature there. Further thought to the old world .. I still see one o the doormen wandering around the Clifton area “Judd” I think his name was he used to be a regular in the grey mare, really tall guy … Also in the late 70’s there used to be this crazy woman dancer up in the top dance room .. Used to see her a lot cycling down bootham … Another old world story was one of the doormen did a bus jump up Clifton moor for charity (think that must have been on what is now the gypsy site) also saw one of local legend Gary Barratts band “nerve senta” in the cellar .. The Old World was owned by Geoff Hull & The 71 Club at the bottom of Micklegate was owned by Neville England, along with Walkers Bar and The Staircase Restaurant all connected by the cellars which stretch for miles under the streets(used to be Walkers wine merchants). I worked there from ’73 for a few years, good times, no bouncers on the door of the 71 Club in the early 70’s, all female door staff. Didn’t need them in those days as people had respect for women & more respect for themselves, there was very little trouble. We had a reciprocal arrangent with the door staff at The Old World, we both let each others staff in for nothing. I remember Judd from the Old World, tall guy with long hair. Judd once hung me over the stairs in the old world, his idea of fun. i used to work at the royal station hotel late 70`s used to do micklegate run old world .71 club aquarius…used to play darts for nags head in micklegate …loved going in grob n ducket ….those were good days .!!! I worked in The Old World, was a chap called Geoff and Lynn Pearson who owned It, I went on to manage the pub they owned on the A64, great times. So glad at last to find this. I used to go every week to this club, when I was a student nurse. It was Fantastic. Had the time of my life there. Do you know what the nightclub underneath Yates was in the 80’s? I’ve just been searching for that myself as I used to go there in the late 70s. I’d park my Lambretta in the small car park down the little alley, behind the church. The nights I went they played Soul Music. I think it was the Aquarius or was that the one in Lady Peckets Yard? Henecky’s Inn I believe was in Blake Street and it either succeeeded The Half Moon Hotel/Pub – or pre dated it. Late 1970s. club. was it open on Sundays. I do remember most of the clubs mentioned above including Tiffanys, The Heartbeat and the Ebor Suite(same nightclub building – different names over the years) where The Rialto Cinema and later Mecca Bingo Hall in Fishergate was. 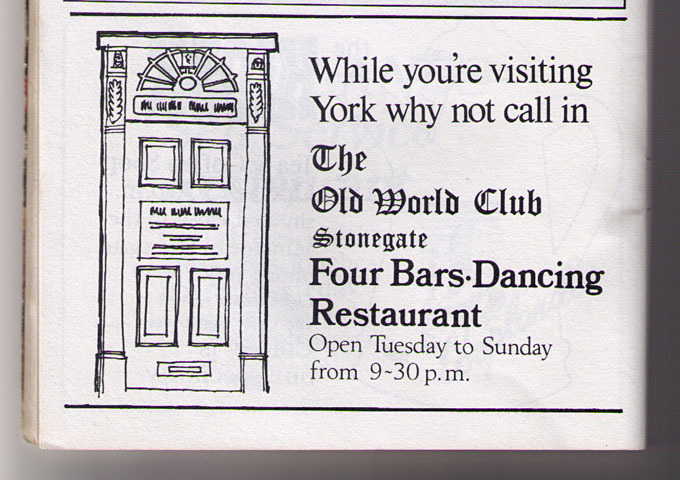 The Olde Worlde Club in Stonegate was opposite Ye Olde Starre Inn. Three levels as I remember. Most popular was the basement disco dance floor – incredibly small – but who cared! In the mid 1960s before it became The Olde Worlde Club, it was the Mandrake Club, popular with senior schoolboy “Mods” at my old school. during the one and a half hour lunch break. Oh – and dont forget Jack and Jill’s nightclub in Bootham during the late 1970s.